The day before a holiday is never as relaxing as you expect it to be, and ours was definitely not about to buck the trend. After run-ins with the neighbours, long waits for the police (long story) and bundling two huge cats off to the cattery, our holiday started the moment we sat down for the day-before lunch. Surprisingly, I've never worked in The Horseguards. 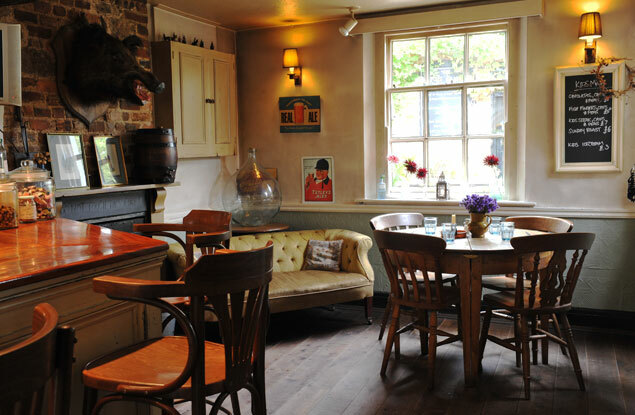 Despite growing up in the next village and working in no less than four pubs and restaurants in the area on and off before finally shedding the hospitality cloak and waving goodbye to being a student, this popular little pub in the rolling hills of the South Downs was a welcome new destination. The best word to describe this place is 'quaint'. Small collectibles adorn every available bit of wall, the furniture's artfully mismatched and there are luxurious ponyskins on the floor. Open inglenooks play host to candles in the summer, roaring fires in the winter; there are two pianos if you fancy tickling the ivories and their country garden is looked after by free roaming chickens. The menu is seasonal and sourced as locally and ethically as possible. A lot of the ingredients are homemade - from the pickles to the preserves, breads to brandies - and you can buy them in The Store too. I was hugely tempted by the pork rillette (I told you, they're totally my thing) and the prawns, which were both starters, but decided on the hake fillet with sea orache, crushed new potatoes and Horseguards spreaded chorizo. The meaty white fish had perfectly crispy skin and flaked easily from the fork, to be scooped up with lashings of the buttery and creamy potatoes and the vitamin-rich orache. The salty, spicy chorizo added a brilliant depth and warmth to the plate and this was particularly good with the side of spring greens and seasonal veg. Mum chose the whole Selsey plaice with Jersey Royals and a buttery caper mayonnaise and this was demolished just as swiftly. Despite being the eve of our holiday and having bikini bodies to think about, we just had to have dessert. I'm a sucker for chocolate pots and this one came topped with whipped cream and a crunchy brittle to balance the rich cocoa that reminded me of the melted middles that ooze from fondants. The rosewater and cardamom parfait had sold out but they offered Mum a honey alternative, with crunchy granola and poached apricots that simply screamed summer. We each chose a glass from their ample (if not a little pricey) wine list, and the bill came to £33 each. Restaurants back home in Sussex definitely are on the more expensive side of the fence which I don't think is completely forgiveable knowing the affordability of eating out in London but this little country charmer did a lot to impress us and I'll definitely be heading here again. Preferably after payday and without a holiday body to think about. Five out of five for sure.